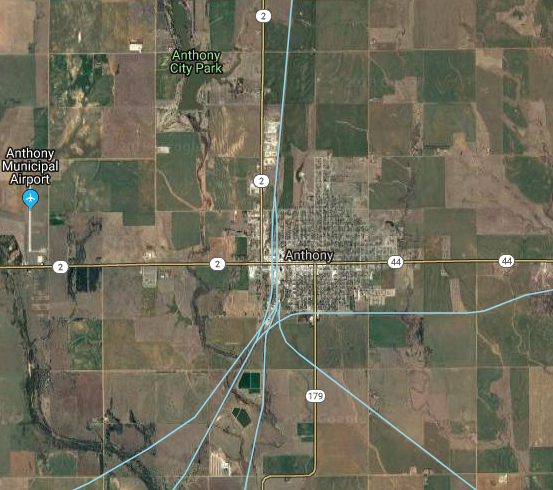 Anthony, KS is a small town in southeastern Kansas, about 50 miles southwest of Wichita. It was incorporated in 1878, and known as a town quite rich in agriculture, with excellent well water, according to their village website. A politician in the early 20th Century remarked of the town, "The center of a great and productive trade territory. The best of municipal services; the finest of schools; amply supplied churches, peopled with the best folks on earth and with a network of railways leading out every direction everywhere, to bring in a constantly increasing business, (Anthony) is the queen city of southern Kansas and the best place on earth to live..."
It's population has remained roughly the same since the early 20th Century, peaking at about 2,900 in the 1930's and mostly dwindling slowly since. While the same village website bills it as a town which "continually upgrades the downtown business district into one of the most attractive towns around", the same cannot be said for it's railroad industry. Several railroads once served Anthony, leading in all four directions. Today, none remain. Anthony, on my Abandoned Railroad Rights-of-Way map, showing the corridors which once ran through it. Before we begin, I should note that I am not here to bemoan Anthony whatsoever; while it undoubtedly faces the same challenges all small towns are facing, I cannot speak to the vibrancy, or lack thereof, of the town whatsoever, having never visited there. I am not writing this to comment on it's decline, or promote it, but merely to discuss the demise of the railroad industry within it. A railroad leaving a small town can have devastating consequences, even today. Many of the towns built in the Midwest and Western US were founded by railroads themselves; thus, the railroad is their primary livelihood. In Anthony's case, it remains what it is today in spite of the railroads not being there. So how did the railroads go from being plentiful in Anthony, to not existing whatsoever? 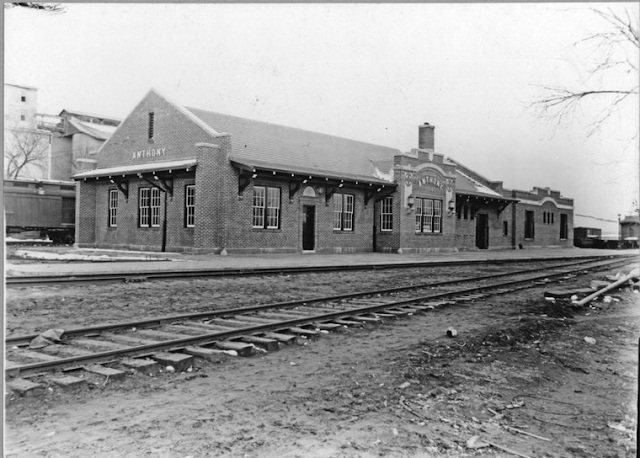 Railroads quickly built trackage in the new town in the 1880's. 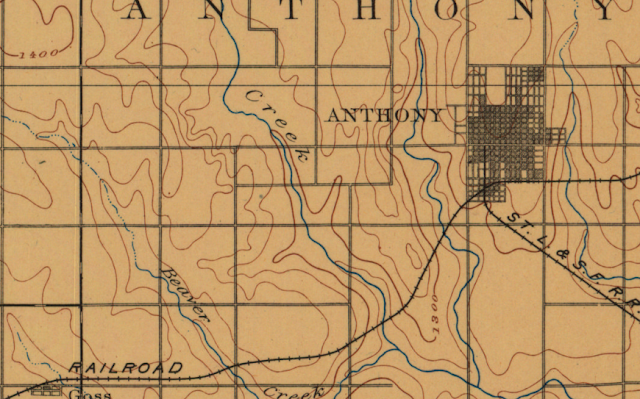 By 1891, Anthony existed at the intersection between the St. Louis & San Francisco Railroad and the Missouri Pacific. By 1912, three more railroads would have lines running through it; The Chicago Rock Island & Pacific, The Kansas City Mexico & Orient, and the Kansas Southwestern. Both the Kansas Southwestern and KC M&O would soon be consolidated into the AT&SF. In 1942, the AT&SF would abandon the former KC M&O line between Anthony and Cherokee, OK, but the railway still had a significant presence in Anthony, and competition from the Rock Island and Missouri Pacific lines. The Rock Island would still run to Waldron and beyond, but bypassed Cherokee to the north. 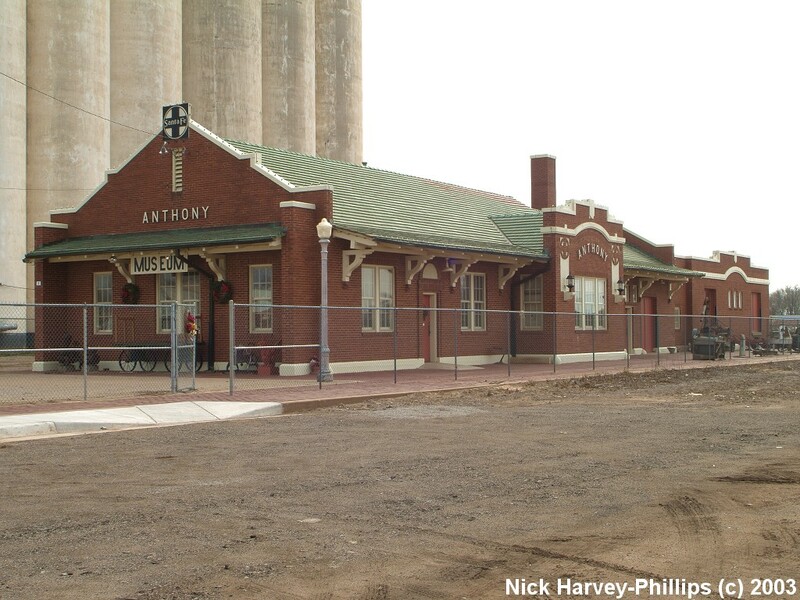 Anthony's railroad infrastructure would remain the same, mergers and acquisitions notwithstanding, at least until 1985, when Union Pacific and Missouri Pacific would begin their merger. But once abandonment of railroad service began, service ended rather abruptly in a fourteen year stretch. In 1986, further abandonment of the AT&SF would begin, when the Anthony to Metcalf stretch was abandoned. Nine years later, the Central Kansas Railway, a short line which used the former assets of the AT&SF, would abandon the remaining trackage to Harper up north. 1999 would be the nail in the coffin for the Anthony to Blackwell, OK line, again by the Central Kansas Railway. The new Millennium, 2000 would be the end of railroad service for Anthony, as the Missouri Pacific's line from Kiowa to Conway Springs was abandoned by another short line, this time a new Kansas Southwestern. While the railroads no longer run, the depot photographed in the first photo is still up. It would make an excellent railroad museum. So why don't the rails run in Anthony anymore? While the railroad industry has undoubtedly gotten more efficient, and is able to move more freight with less rails, it's an argument that falls on some deaf ears if there are no rails left in the town. Ironically, however, the demise of the railroad industry cannot be blamed on funding of the Interstate Highway System or the US Route System; only Kansas State Routes run through the town. Anthony is thus a victim of efficiencies, as railroads found more profit margins to be made in other nearby routes. Like any business, the railroad has to be profitable, and if short line railroads don't see the potential for revenues by providing service to Anthony, it won't happen. Further still, while many rights-of-way were relatively recently abandoned, none have turned into rail trails and railbanking agreements, making the path toward railroad reactivation that much more difficult, if not impossible. Frankly, I'm neither an expert in business nor transportation, so at the end of the day, it is up to the people of Anthony, and the stakeholders of any potential project, to decide their own fate. Still, the railfan inside me yearns for a railroad museum and perhaps even a tourist railroad in Anthony. As always, no one knows what the future holds.